It intends to extend the zones to the three areas of the borough where they have not already been implemented or are in the process of being implemented. The council said the move ‘will make Croydon a 20mph borough, with the exception of major through roads and roads where it is impractical’. Croydon began implementing 20mph zones last year, following a pledge to bring them in across the borough by 2018. Councillor Stuart King, cabinet member for transport and the environment, said: ‘I’m really pleased we’re delivering on our 20mph manifesto pledge. Residents have told us they want streets and communities to feel safer and be safer and reducing speed on the roads is one way we can do this. 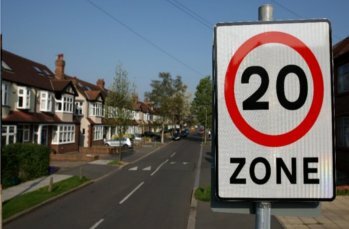 The council said that extensive 20mph limits ‘reduce the risk and severity of accidents, cut congestion and pollution levels, encourage less car use and discourage rat-running in quieter streets’. The new zones are planned for parts of North-west, South-east and South-west Croydon. Croydon said it will monitor traffic speeds within the new zones roads and that if speeding remains an issue, options could include traffic calming measures as well as police enforcement. On some roads where the 20mph limit has already been implemented, it has also installed numberplate recognition speed visors and electronic signs that flash up each vehicle’s speed. The council’s Traffic Management Action Committee will consider responses to the statutory consultation, which begins on Wednesday (18 January).